Winterkorn has led VW to record sales and profits. 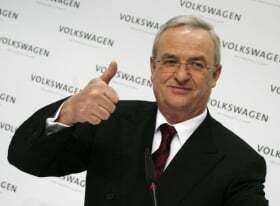 WOLFSBURG -- Volkswagen Group CEO Martin Winterkorn, who led the carmaker to a record profit last year, earned 17.5 million euros ($23 million) to top the rankings as the best-paid CEO among companies listed on Germany's DAX Index. Winterkorn's total compensation for 2011 increased 87 percent from 2010's 9.33 million euros, Volkswagen said. His earnings included an 11 million-euro bonus. Winterkorn's pay was the highest among CEOs of the 30 companies that comprise Germany's benchmark index last year. The increase is a recognition of the carmaker's "clear earnings advancements" under his leadership, Horst Neumann, personnel chief, said at the company's annual press conference on Monday. Winterkorn took over as VW CEO in January 2007. Chief Financial Officer Hans Dieter Poetsch is the second best paid executive on VW's eight-member management board, earning 8.1 million euros last year, up from 4.2 million euros in 2010. The management board's total compensation surged 92.4 percent to 70.6 million euros. VW's earnings before interest and taxes gained 59 percent last year to 11.3 billion euros. The automaker, whose brands include Audi, Bentley, Skoda and Seat, sold a record 8.3 million vehicles in 2011, a 15 percent gain on the previous year. Daimler CEO Dieter Zetsche's pay fell slightly last year to 8.65 million euros, even after posting record results. BMW will release salary details for its executives on Tuesday.